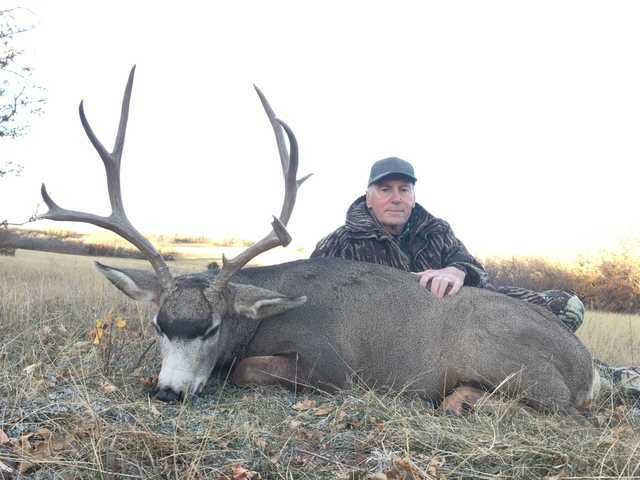 Jack called me in January of this year and we began a discussion about a mule deer hunt. He made it very clear that he was looking for an experience, not a canned hunt. We made arrangements and he booked the hunt. Fast forward to Saturday morning. We are there at daylight and get into position. There are about a dozen mile deer does and a couple of very small bucks in the meadows we can see. We watch a herd of 60 elk feed down the hill at less than 300 yards. There was a really big bull (340's) in the herd along with a couple of smaller ones. Once they disappeared, we had another small group of about 10 elk come back through. There was a nice young bull in the group. We were watching the meadows and I spotted movement inside the edge of the furthest meadow that we could see. As I watched, 3 bucks materialized from the edge. None of them were what we were looking for, but it was encouraging. As I watched them, I saw motion behind them. I saw the top of a very nice rack appear, then disappear just as quickly. We never saw who it belonged to. That evening, we went back and sat in the same spot. We anticipated their arrival about 60 minutes before dark. Sure enough, at 5:30 we had a nice buck come out of the trees and walk straight across a meadow. We kept watching that area and could not make out any more deer. About 15 minutes before the end of legal shooting light, more deer came out. All were bucks. They were feeding along the edge of the meadow. There was one really nice deer in the group, but he was not quite what we were looking for. We kept watching. All of a sudden, a really good buck came walking out of the woods. It was dark enough, I could not judge his rack very well. I knew he was crab clawed in both antlers, but he had a sticker coming out of his left. It was too dark to do anything by this point, so we backed out. We came back in the morning. We saw deer as we got there. Sure enough, it was the group of bucks. We still could not make out exactly how big he was. His body size was huge. He was 25% bigger than any of the other bucks he had been around. We knew he was a nature deer. We made a stalk to get closer (we had been glassing at 400+ yards). We rounded the corner to where we should have been able to see, we were caught by a really nice 2x3. We had to back out so we did not bump them. That evening we went back and set up about 250 yards from where I believed they would come out. 5 minutes before shooting light was over, 2 smaller bucks walked out. They kept looking back in the brush, but we could never see anything. It got dark and we headed out. Monday morning we got back to our main lookout point. We had deer running everywhere. They were all does and little bucks. The elk were just below us bugling at each other. We could hear the cows talking to each other. It was a lot of commotion. The deer were even looking down the hill at them. I finally found a buck bedded in a meadow. We could not tell anything about him as he was 600 yards away. We put on a stalk to get closer. We had gone about 300 of the 400 yards I had wanted to cover. We were walking slowly down a trail, using the edge as cover and the group of does comes running around the corner, straight at us! We freeze in place. The deer keep coming. Now we are stuck with a group of 10-12 does anywhere from 10 to 90 yards away. They are disturbed by something and were quite restless. I look past them and there is another die running across the meadow at about 150 yards. Right behind her is the buck! I can immediately see that it is the one we have been trying to find more about. He turns and starts running straight towards us. Jack asks me if it was him and I replied that it was. The buck kept coming and all of a sudden this coyote comes bursting out of the grass, running for his life. He is running straight towards us. At about 3 feet from my leg, the coyote realizes that I am not a tree and jumps. There was no way he was going back to the deer, so he angled up the hill with his afterburners on! 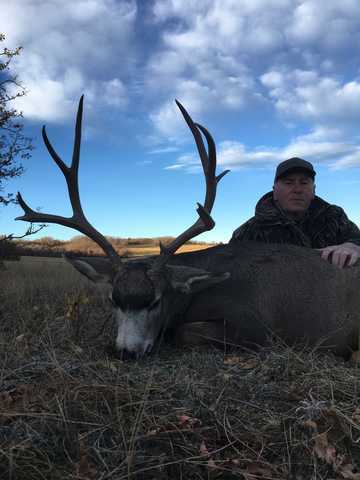 The buck stopped at 39 yards. I am looking at the deer and Jack flips off the safety. He makes the shot and the deer goes down. We walked up to the deer and what a trophy! I have never seen a deer with a body that big in my life! We got a few pictures and loaded him up. What a great hunt we had. 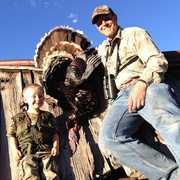 Congratulations, Jack, on your first mule deer!